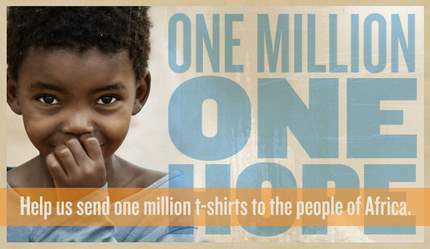 Since a couple of marketeers started the One Million Shirts campaign, it looks like to be fashionable in the aid world, you have to write about it. Bla bla bla bla bla bla bla bla bla bla bla bla bla bla bla bla bla bla bla bla bla bla bla bla bla bla bla bla bla bla bla bla bla bla bla bla bla bla bla bla bla bla bla bla bla bla bla bla bla bla bla bla bla bla bla bla bla bla bla bla bla bla bla. ;-) I can be pretty sarcastic at times. And opinionated too...! Initially I agreed with Pernille, but I have to say that I enjoy a snarky post about people's snarky blog posts (I include myself in the latter lot). What are you doing to make a positive difference in the world? I commend Jason and Evan for taking on such an admirable project. Having done large fundraisers in the past personally (and raising well over $25,000 for a local Children's hospital) I know how much work goes into something like this. I don't understand negativity directed towards a positive movement. 1/ In my opinion, the whole 1millionshirts project is nothing but a marketing project. It has not much to do with aid. 1m shirts to Africa? for what? They don't even have enough food to eat, clean water to drink/use or got proper and timely vaccination there.